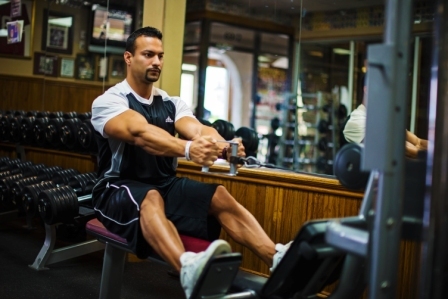 Proper exercise technique will increase the intensity of your workouts, while decreasing the risk of injury to your joints, connective tissue and muscles. It will allow you to maximize the muscle growth potential of each exercise, and minimize the amount of time you spend out of the gym due to injuries. If you've ever worked out at your local gym, then you've probably seen your fair share of bad exercise technique being performed. Many people using free weights and weight machines still have little to no clue as to how to weight train. Have you ever witnessed a similar incidences yourself? Why is poor exercise technique so common? 1) The person is new to weight training, and hasn't researched or been taught how to weight train properly. One problem is that people will often skip the consultations offered to them at the time they sign up for a membership. Either because they think they know what they are doing, or, are afraid to hear a personal training possibly tell them they need some guidance. Instead, they'll often walk right in to the gym and start weight training even though they have had no prior experience and/or knowledge. Even better, following a YouTube video that was made by a person that thinks they knows what they're doing. Can you imagine yourself walking into a car dealership, asking to test drive a manual transmission vehicle when you've only ever driven an automatic? 2) The person is usually lifting weight that is just too heavy! Usually because they're trying so hard to impress their friends, or just want to be able to tell their gym buddies that the were able to bench "X" amount of weight for "X" amount of reps. The barbell curl is the basic bicep exercise that helps increase the size of the muscles. *Start off standing up straight with your feet shoulder-width apart, keeping your knees slightly bent and abs drawn in tight. *Grab a barbell with a shoulder width underhand (palms up) grip, lowering your arms down to your thighs fully and bending slightly at your elbows as this will be your starting position. 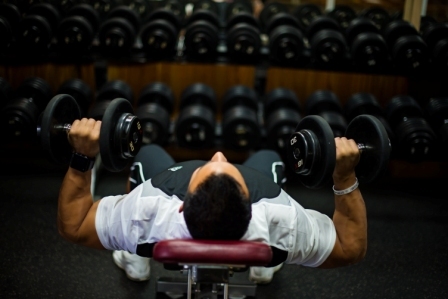 *Slowly raise the bar towards your upper chest, squeezing your muscles and isolating the biceps. *Hold this position for a count and then return back to the starting position. *Start off taking an elevated platform and placing it on top of the bench for a cable row machine. *Sit down on the bench placing your feet on the foot rests in front of you, keeping your knees slightly bent and then lean slightly to grab the handle to perform the exercise. *Slowly extend your arms and elbows back pulling the handle towards your lower chest, feeling a stretch within your lats and lower back. *Start off by setting up a bench on a 30 degree incline and then place dumbbells by your feet. 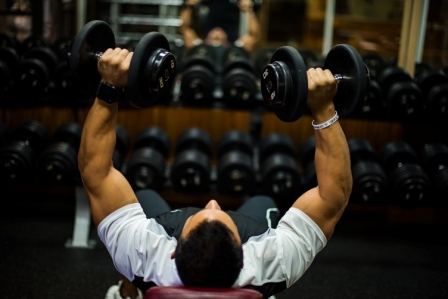 *Take the dumbbells and bring them to the starting position which is just above your chest, keeping your elbows bent so that your forearms are facing upward. *Then push the dumbbells up in a straight motion, focusing on squeezing your chest and targeting those muscles on the motion upward. 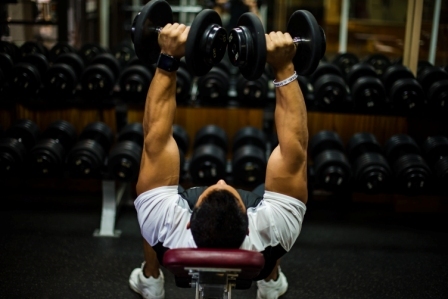 *Raise the dumbbells up as high as your can without locking your elbows and hold for a count. *Return back down slowly to the starting position and repeat for as many reps and sets as desired. It is important to use a weight that you can manage so that you are able to get into the starting position easier for this exercise. *To begin this exercise; start off by standing feet shoulder width apart and flex at your knees and torso sitting back with your hips. *Cross your arms out in front of you and squat down until your knees are parallel with your glutes. *Start off standing up straight with your feet shoulder width apart and your arms rested at your sides, holding dumbbells in each hand. 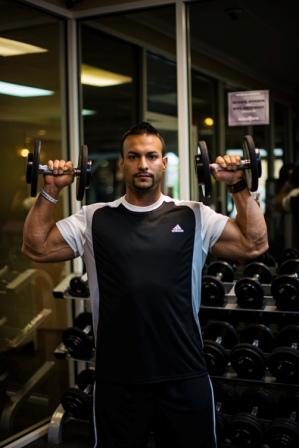 *Raise the dumbbells to head level so that your arms are creating a 90 degree angle. *Slowly push the dumbbells up, by extending through the elbows, over your head, feeling a stretch in your shoulders. *Hold for a count then return back to the starting position.